1964. This is one of the very first video display terminals. 2260s were installed at Columbia in the 2nd-floor Computer Center public-access terminal room from 1969 to 1972, when they were replaced by Hazeltine 2000s. "The IBM 2260 display station is a compact cathode ray tube (CRT) display terminal similar in technology to a television monitor. An optional keyboard feature provides for man-machine communications at the display station... The 2260 can display up to a maximum of 960 characters on the face of the CRT, arranged as 12 lines of 80 characters each." Up to 8 units can be connected to the IBM 2848 control unit (more if number of lines per screen is reduced) . 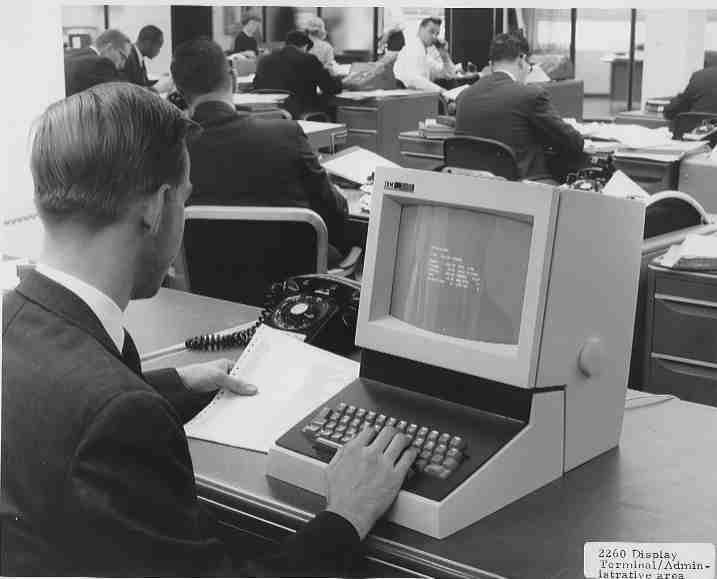 From Peter Capek of IBM, who was here in the 1960s: "[The 2260] was a characters-only display intended for simple transaction and dataentry applications. It came in a couple of versions with (I think) 480 or 960 characters per screen. It was attached by thick cable to a control unit (2848, no more than a couple of hundred feet away, I think), which provided a video-like signal for refreshing the screen. The display itself, shown in the picture, was little more than a CRT, and as I recall, cost about $1K; the controller, which could handle about 8-16 of these heads, was pretty expensive. What was unusual was that the refresh was vertical, rather than horizonal which it is almost always. The refresh signal was generated from acoustic delay line memory (basically a wire long enough so that, at the speed of sound in the wire, the travel time from end to end corresponded to a refresh cycle of the display) in the control unit. What was interesting about that is that the delay line stored the IMAGE of the graphic character to be displayed, which was written into the memory when (either) the character was typed, or written from the channel. The translation of EBCDIC/key code to graphic was accomplished in the CU with a single plane of core memory which was partially populated -- you could see the images of the characters. And to avoid the problem of going from the graphic back to EBCDIC when the screen contents was read by the channel, the space in the delay line which corresponded to the space between characters was used to store the EBCDIC. Interesting how the tradeoffs in this kind of design have changed so dramatically." Also see: The IBM 2250 Display Unit.